“We Rock FM” Music Therapy Camp is a community group opportunity that engages individuals of all ages in a weekly 45 min group for 6 weeks. All sessions provide opportunities to increase skills such as socialization, communication, physical activity, gross and fine motor skills, memory, as habilitation. The group focuses on the enjoyment of making music with others, singing, dancing, socializing and movement. All sessions are led by a MT-BC/L (Board Certified and Licensed Music Therapist). Please note: A family member or staff must be present at each class to aid participant as needed. All instruments and supplies will be provided. We Rock FM takes place on Mondays from 4:15-5:00pm and runs for 6 weeks. Cost: $72 per 6-week session. Payments are due in full on the first week of class (if you need to make weekly payments, please let us know). 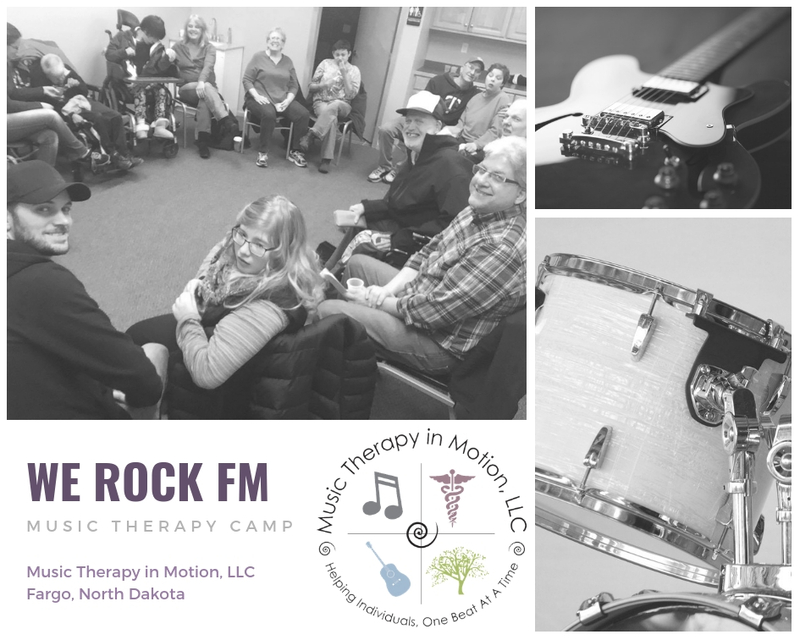 We Rock FM takes place at Music Therapy in Motion (6046-B 14th St. S. Fargo, ND 58104 – directions). Photos, video, or audio may be taken during We Rock and may be used for education and training purposes (i.e., clinical supervision, conference presentations). They may also be used by Music Therapy in Motion, LLC for advertisement purposes (i.e., brochures, website, social media, and newspapers). If you do not grant permission, photos and videos of the rocker will not be used outside of class for any reason. Yes, I do grant permission. When you click on Submit & Pay, you will be automatically redirected to PayPal to complete your registration. Please email us if you experience problems registering!